Mixed gauge at Braniewo. This is the area where cargo is relaoded between Polish normal gauge trains 1435 mm and Russian broad gauge 1520 mm trains close to the border between Poland and Russian enclave of Kaliningrad (former Königsberg) in the former German East Prussia. Even liquid gas was here being pumped from one lot of wagons to another. At the right hand side in the picture can just barely be seen a modernised class SM42 standard gauge switcher locomotive. Picture from Braniewo station 4.4.2017 by Ilkka Siissalo. Reloading station at Braniewo. The tracks on the right are normal gauge and the tracks on the left Russian broad gauge. A locomotive can be seen in the middle of the picture, on the broad gauge tracks. This is a former Russian TEM2, now owned by the Polish PKP and painted in PKP's colours. 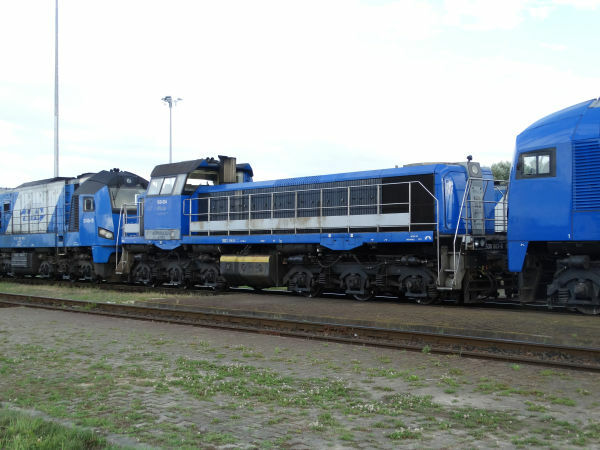 In Poland it is called class SM48. Picture at Braniewo station 4.4.2017 by Ilkka Siissalo. An old Russian boxcarwagon with Soviet time CCCP texts, but regauged to normal gauge. At this end of the wagon an extra metal bar with European style train buffers has been fitted into the Russian style SA-3 central coupler. From the other end of the wagon these extra buffers were missing. 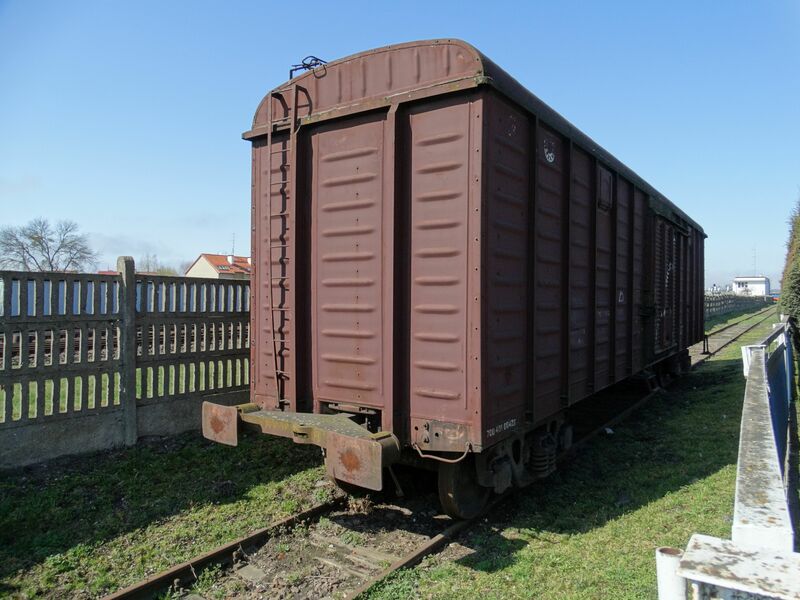 Apparently this had been used as a buffer wagon between regauged Russian wagons and normal European wagons with buffers and screw couplers. Picture at Braniewo station 4.4.2017 by Ilkka Siissalo. 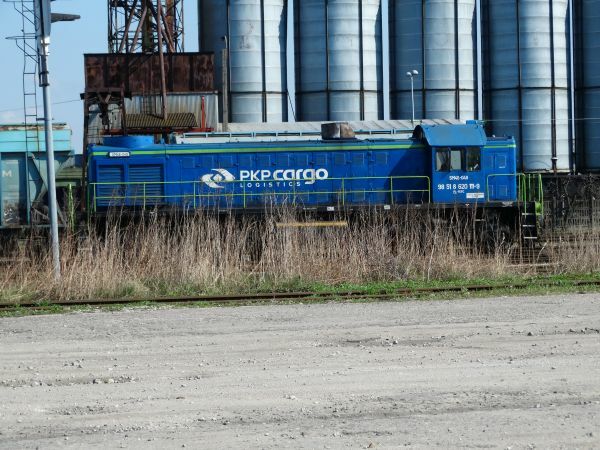 A Russian TEM2 old broad gauge switcher locomotive, now repainted to PKP's colours and rebranded as PKP Cargo's SM48. Picture at Braniewo station 4.4.2017 by Ilkka Siissalo. 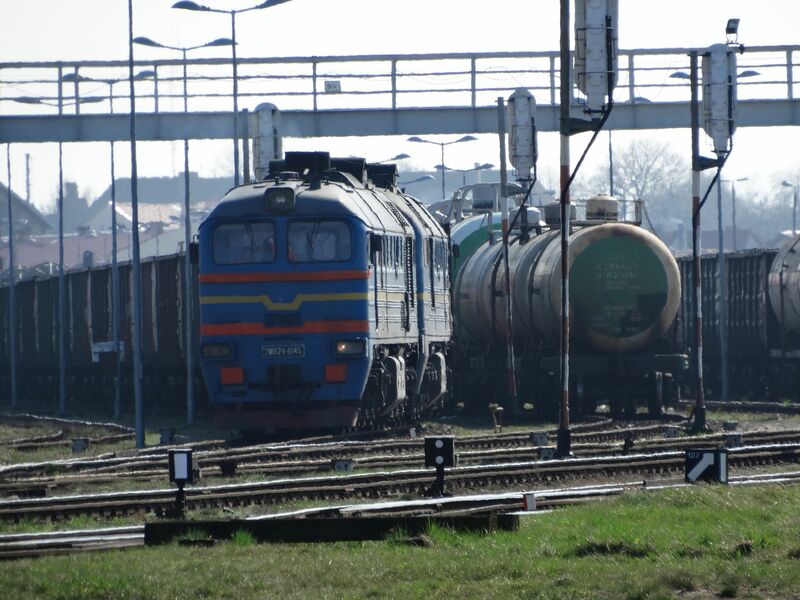 An ex Russian TEM2, now PKP Cargo SM48, performing switcher duties with oil wagons. Picture at Braniewo reloading station 4.4.2007 by Ilkka Siissalo. Another one of the TEM2 alias PKP SM48 machines, here freshly renovated and painted. Picture at Braniewo reloading station 4.4.2007 by Ilkka Siissalo. Yet another PKP SM48. Note the difference between this machine and the blue one pictured above. 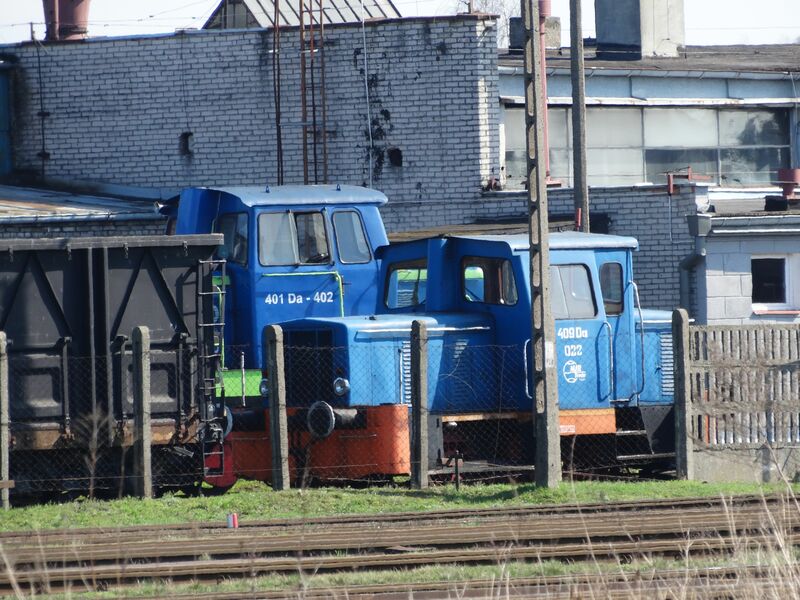 Just like in Russia, also here there are different body types of the same TEM2 machines. Some have small windows with a view from the cabin onto the roof of the train, this one has not. Picture at Braniewo reloading station 4.4.2007 by Ilkka Siissalo. Same machine as in the picture above, but seen from a different angle. 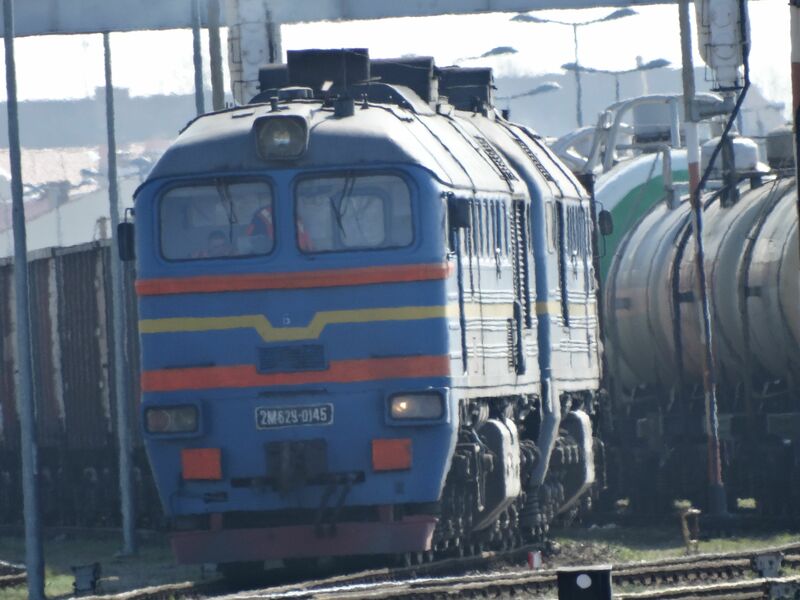 Note the couplings in typical Russian style: central coupling, no buffers. Picture at Braniewo reloading station 4.4.2007 by Ilkka Siissalo. 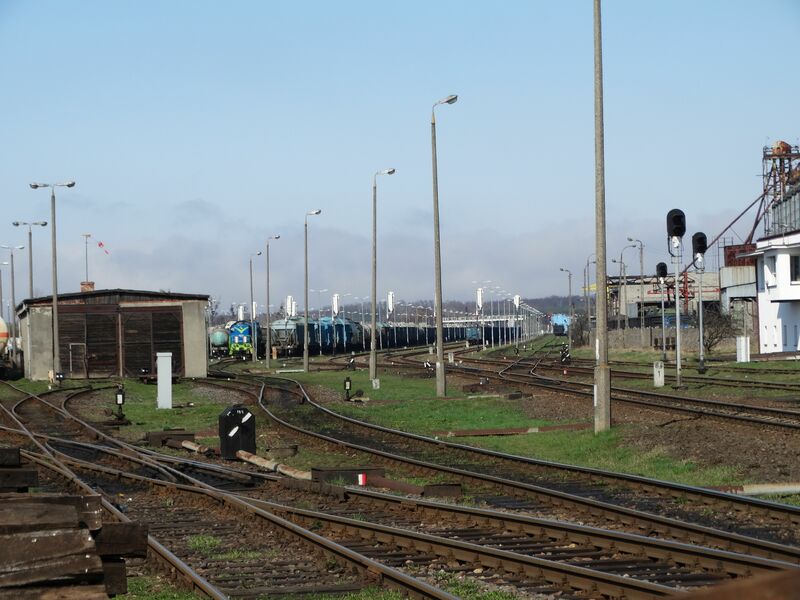 Two small switchers at the normal gauge side of the Braniewo reloading station. The 401 Da is a small dieselelectric switcher built by Fablok in Chrzanow between 1966 and 1979. The Zastal 409 Da is even smaller and was built 1972-1995 by three different producers: Zastal, Mystal and ZNTK Oleśnica. It weighs 24 tons and has a maximum speed of 30 km/h. Picture at Braniewo reloading station 4.4.2007 by Ilkka Siissalo. An old, huge Russian RZD Kaliningrad Railways M62U ready to start pulling a long cargo train loaded with Polish coal over the border to Kaliningrad area. Picture at Braniewo reloading station 4.4.2007 by Ilkka Siissalo. A closer view of the same 2M62U as in the picture above. Note that the 2M62's of Kaliningrad Railways are blue, whereas the similar Russian machines in the Baltics and Carelia are green. Picture at Braniewo reloading station 4.4.2007 by Ilkka Siissalo. 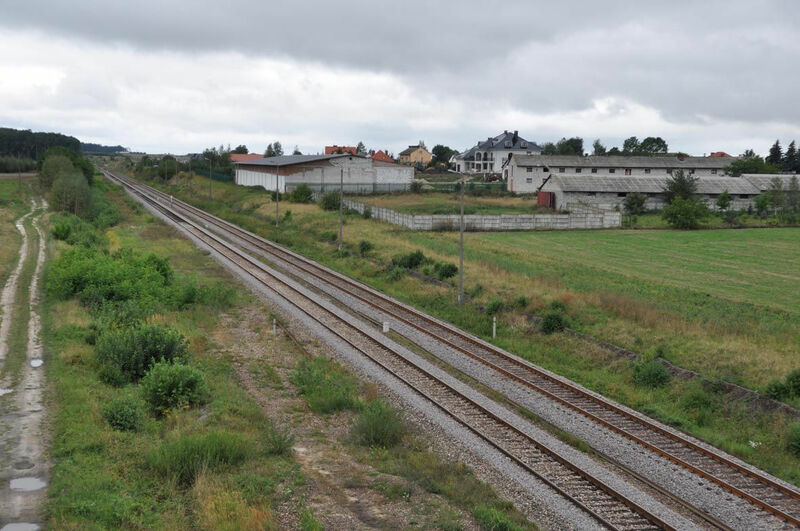 In addition to short stretches of 1520 mm broad gauge near the eastern border, Poland has also one really long broad gauge line, which comes from the east, goes right through the country to the west to reach the important formerly German mining regions of Silesia (Schlesien). It was built during the communist years in order to nicely transport the formerly German coal now to Russia. But the line is still today in frequent use, for example in importing liquified natural gas from Russia. 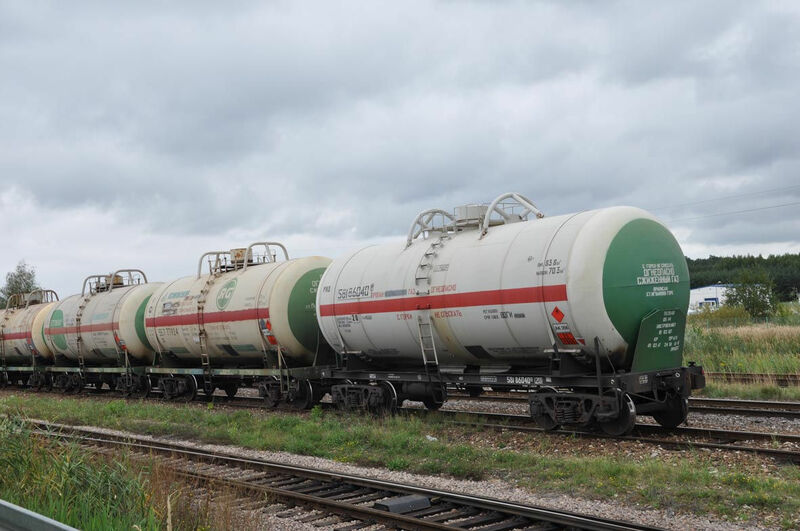 These are Russian LNG gas wagons on broad gauge track in Goluchow, roughly halfway between the cities of Póznan in the west and Lódz in the east. The company Novatek has a liquified gas reloading station quite next to the Goluchow train station by the long distance broad gauge so called LHS track. Picture 2.9.2017 by Marek Graff. 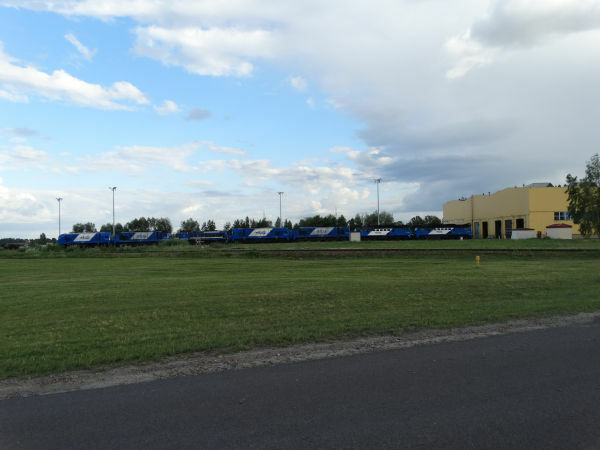 Russian state railways RZD broad gauge coal wagons waiting to load Western Polish coal. Picture 2.9.2017 in Goluchow by Marek Graff. 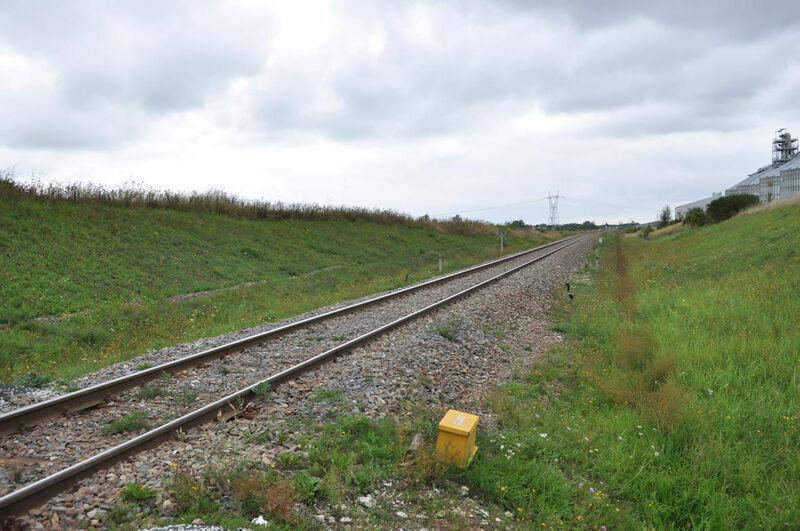 Long distance 1520 mm broad gauge track deep in Poland by the LHS broad gauge line. A normal gauge 1435 mm line side by side with the so called "metallurgy line" or LHS 1520 mm line in Jędrzejów county near the station of Sędziszów. Picture 2.9.2017 in Jędrzejów by Marek Graff. 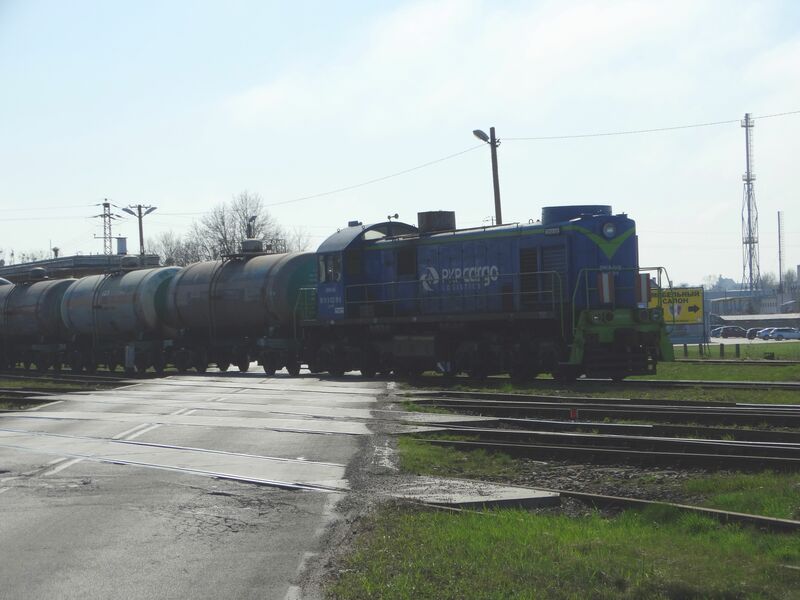 Traffic on the "metallurgy line" 1520 mm is handled in Poland by the company LHS. 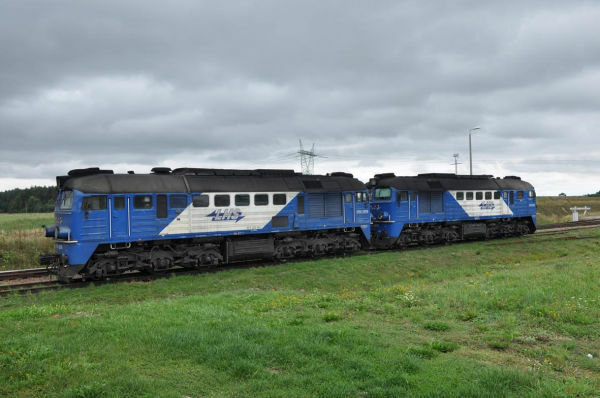 These odd looking locomotives are in Poland called class ST40, but in fact they are totally rebuilt Soviet Russian M62 machines from the 1960s. Only the original undercarriage has been saved, all the upper parts of the locomotive including new engines and totally new driver's cabs are the result of the renewal. 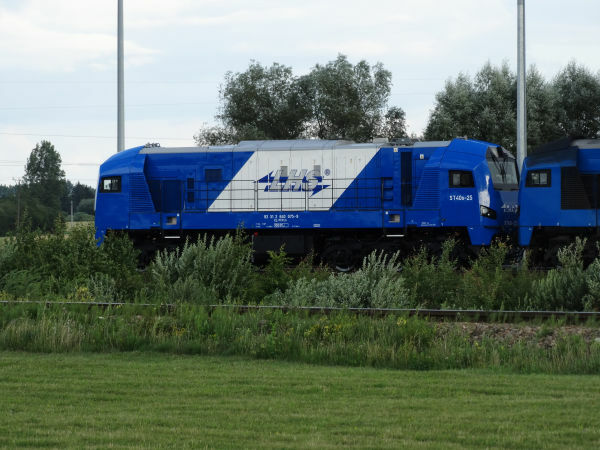 These renewed M62/ST44 locomotives exist in Poland both as broad gauge and as normal gauge locomotives, now called ST40. 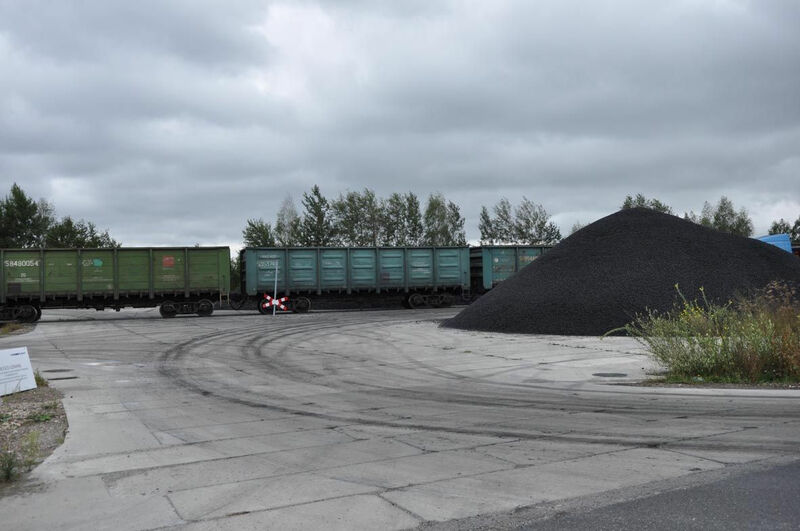 Here the train consists of empty Russian coal wagons coming to fetch more Polish coal. Picture 2.9.2017 in Kije by Marek Graff. 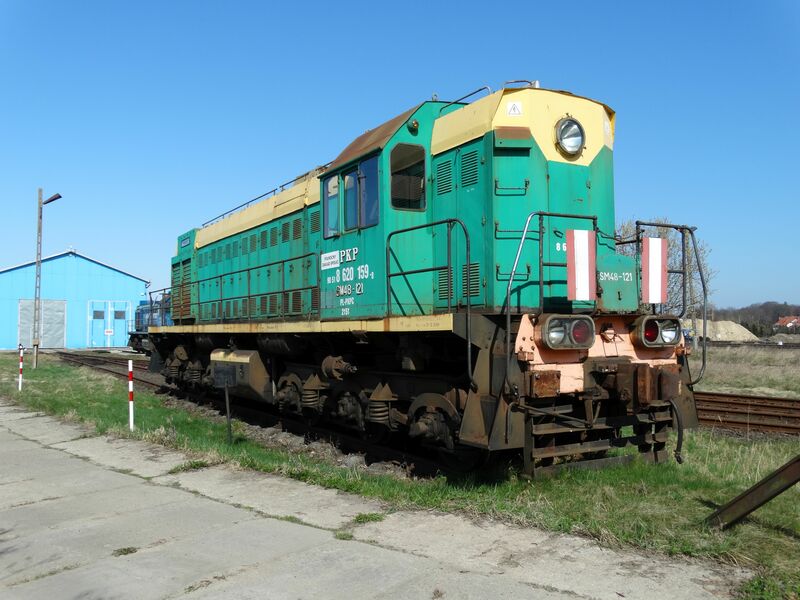 One of the totally rebuilt originally Ukrainian M62/Polish ST44 locomotives, now called ST40s. Picture from the LHS railway depot at Zamosc-Bortatycze 30.6.2018 by Ilkka Siissalo. Side view of one of the rebuilt locomotives now called ST40s. 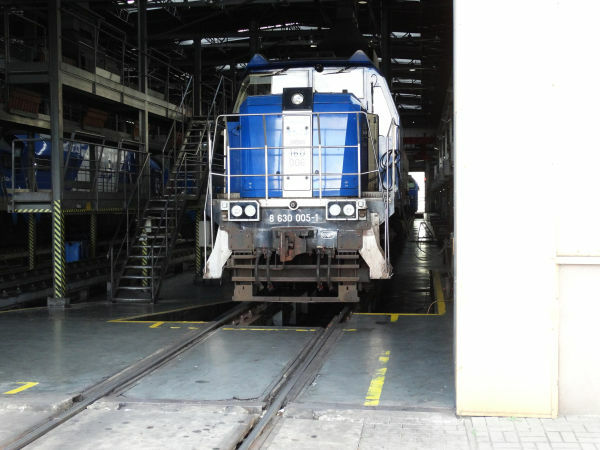 LHS uses also old M62/ST44 locomotives "as is", without modernisation. Compare these machines with the ST40 shown above. It's hard to believe that it is the same machine, but indeed it is, after and before modernisation. These are broad gauge machines, otherwise just like the Russian or Belarusian M62s, except that they have larger lamps just like their normal gauge Polish counterparts, these also are called ST44 just like the normal gauge ones are and they have buffers, again just like the Polish normal gauge ST44s have, but their buffers are by far shorter than in normal gauge locomotives. 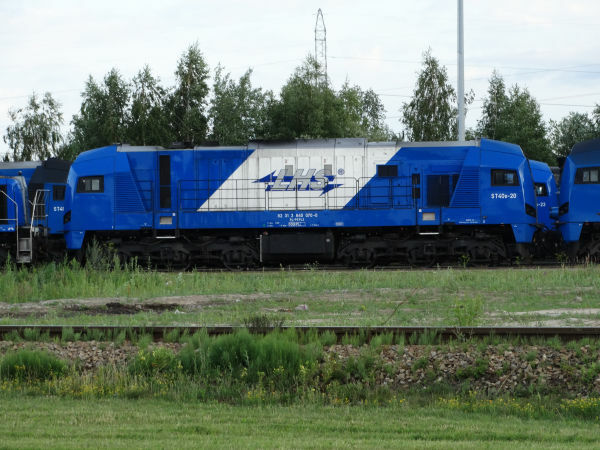 In Russian similar M62s buffers do not exist. A second view of a pair of non-modernised ST44 (M62) locomotives of LHS. The depot of the LHS broad gauge railway is at Zamosc-Bortatycze. This is the depot seen from further away. The whole line is often called the broad gauge metallurgy line. The operator company is PKP Linia Hutnicza Szerokotorowa, a daughter company of state railways PKP. 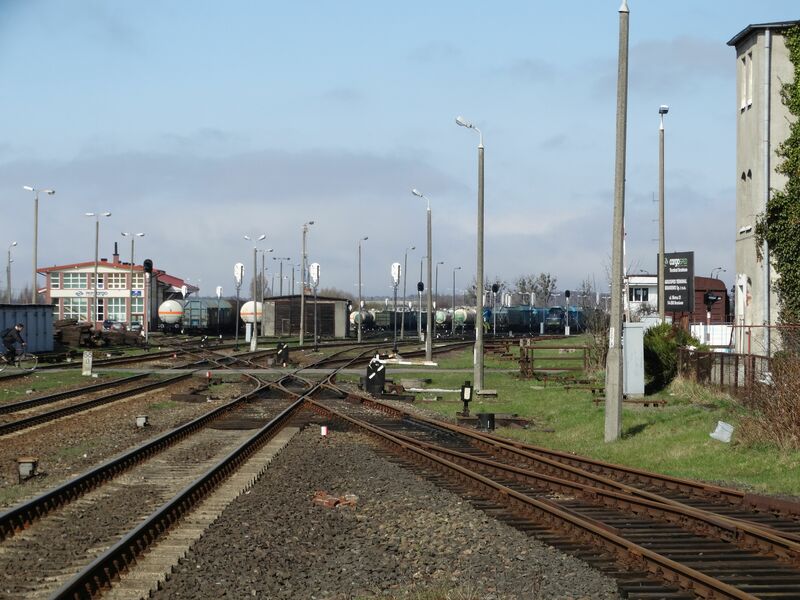 The line runs almost 400 km from the Polish-Ukrainian border crossing just east of Hrubieszów to Sławków Południowy 395 km and the total track length is 600 km. There are 6 stations on the line. The logic of the whole system was to bring in iron ore from Ukraine and coal from Silesia and bring them both to a huge new steel mill, the Huta Katowice steel mill and then bring its products to the USSR. Picture from Zamosc-Bortatycze 30.6.2018 by Ilkka Siissalo. 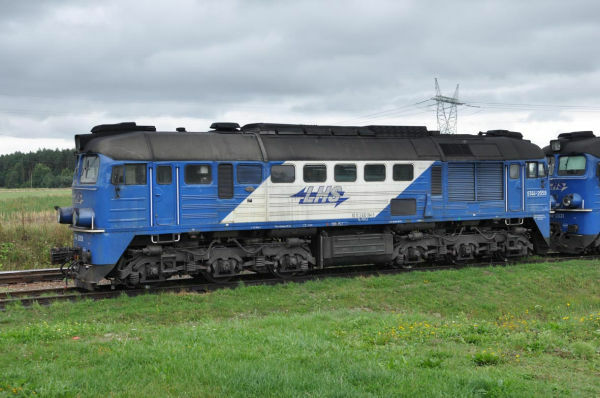 Newag's type 16D is a totally new locomotive but it is based on a "deeply modernized" Soviet Russian TEM2. 16d is the broad gauge version and model 15D is the same machine but with normal gauge. The TEM2s used were originally built in Bryansk in 1974-89 and now rebuilt by Newag at Nowy Sącz. 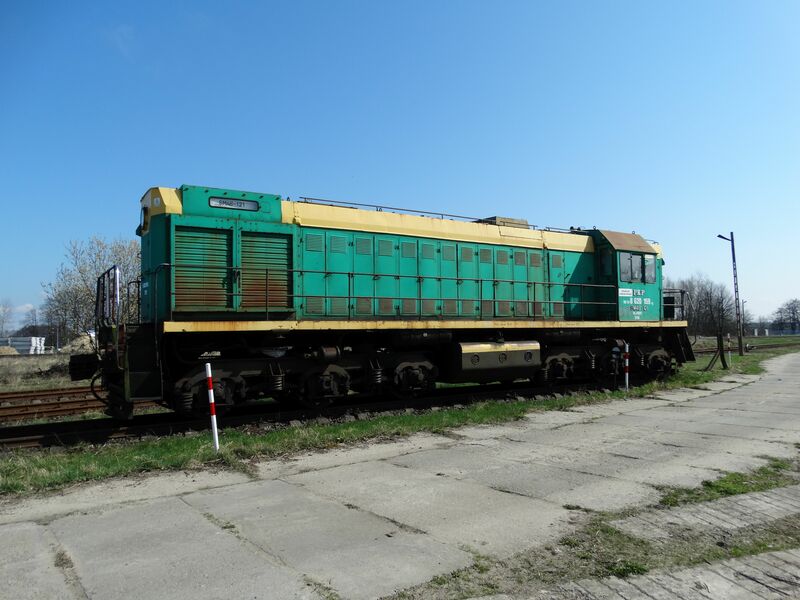 Old Soviet engines were also replaced by Caterpillar 3512C machines. 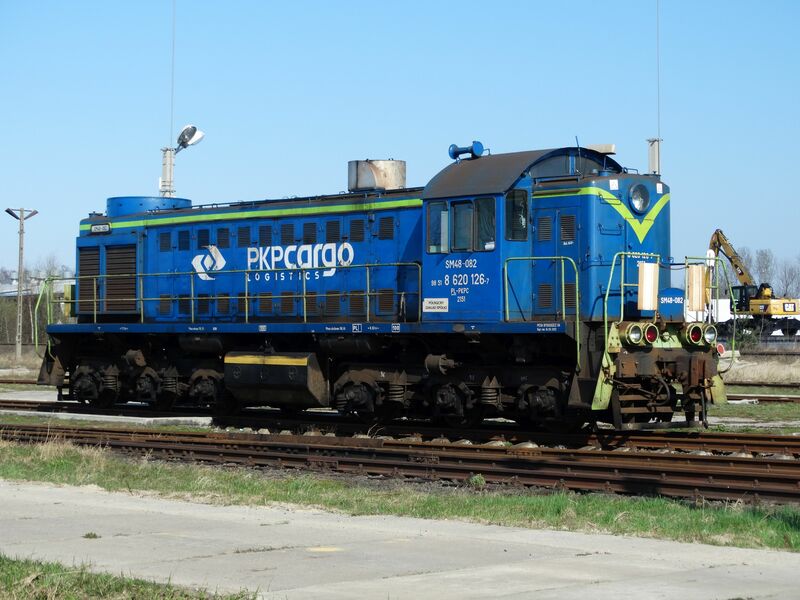 Now the locomotives have a power rating of 1550 kW and a top speed of 100 km/h. 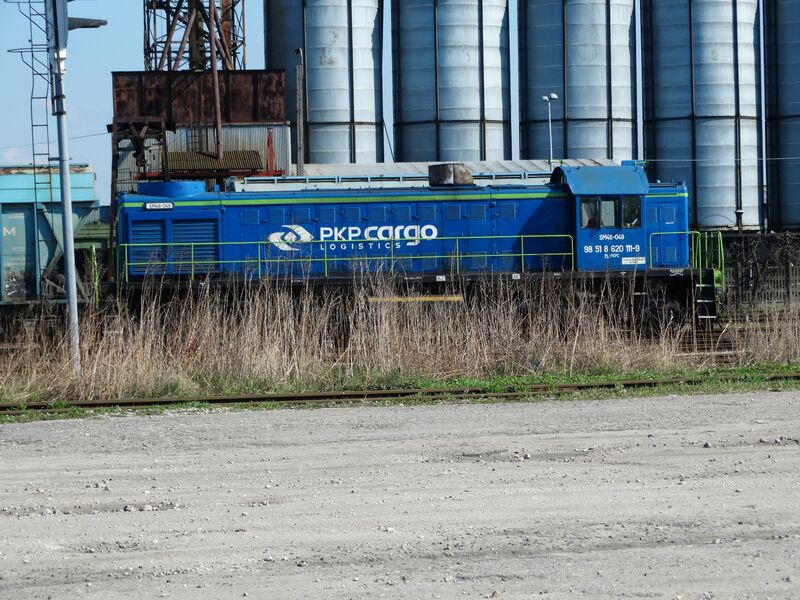 PKP LHS has now seven of the broad gauge version 16D machines. Another one of the Newag 16D new machines at LHS' depot.